Chinese Jade ornament with flower design, Jin Dynasty (1115-1234 C.E. ), Shanghai Museum. Chinese art (Chinese: 中國藝術/中国艺术) is art, both ancient and modern, that originated in or is practiced in China or by Chinese artists or performers. The Chinese art in the Republic of China (Taiwan) and that of overseas Chinese can also be considered part of Chinese art where it is based in or draws on Chinese heritage and Chinese culture. Traditional Chinese art is influenced by Confucianism, Daoism and Buddhism. Chinese art (Chinese: 中國藝術/中国艺术) has taken various forms throughout its history, as political and social circumstances changed and new technologies developed. 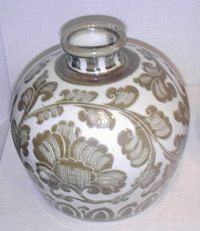 Artistic styles are usually classified according to the dynasty under which they were produced. Artists and artisans in ancient China relied heavily on the patronage of the imperial court and the aristocracy. Chinese art encompasses fine arts, folk arts and performance arts, and includes painting, poetry, calligraphy, architecture, pottery, sculpture, bronzes, jade carving, textiles and other decorative arts. Confucianism, which became prominent during the first century B.C.E., established a rigid social and political hierarchy and a love for harmony, order and regulation. Social rank was distinguished by laws that dictated such things as the size and height of residences and the clothing and colors that could be worn by each class and status. Aristocratic families demonstrated their importance by wearing fine silks and commissioning portraits, works of art and costly porcelain pieces to decorate their homes. Respect for tradition gave rise to highly stylized forms of poetry, calligraphy and painting. Works of ancient masters were copied and re-copied. Rulers assigned groups of scholars the task of documenting the history of previous dynasties in order to demonstrate how the “Mandate of Heaven” had passed to the current dynasty. The Confucian civil service examinations, formalized during the Sui dynasty (581 – 618) selected eligible candidates for government service by testing them on their knowledge of the Confucian classics and their ability to write. Candidates who passed the exams were elevated to a scholarly aristocracy in which gentlemen were admired for their abilities in music, calligraphy, painting and the composition of poetry. The brush, ink, paper and inkstone used in Chinese calligraphy and painting were commonly referred to as the Four Treasures of the Study (Traditional Chinese: 文房四寶 Simplified Chinese: 文房四宝 wén fáng sì bǎo), and many of the greatest Chinese painters were bureaucrats and members of the literati. Imperial courts also assembled schools of professional artists to produce portraits and other paintings for official purposes. The Confucian attitude of respect for education and reverence for the past ensured the continuance of an educated elite who preserved artistic traditions even through violent dynastic changes. One of the greatest Confucian poets, Du Fu (712–770 C.E. ), was admired for his humanity and sense of morality, and for his mastery of lǜshi (formal verse). Daoism emphasized the individual’s experience with nature and the concept that, "Heaven and earth and I live together." Daoism especially influenced Chinese landscape painting, known as shan shui (mountain-water-picture). Artists attempted to convey the harmony of nature through a balance of the elements, such as water, trees, mountains, and clouds, in their landscapes. People were often portrayed as tiny figures in vast natural settings. Chinese paintings did not seek to capture the physical likeness of a subject, but its internal characteristics and qualities. This was achieved both through the spontaneity and ingenuity of the individual artist, and through the use of conventions of color and style that conveyed a message of their own. Artists often painted indoors from memory, rather than by looking at their subject. By contemplating a painting, a person was supposed to be able to understand the power of nature. The highest ideal of the literati painter was that he should work only when inspired. The Chinese used the term “flight of the dragon” to describe the moment when an artist, truly inspired, transcended physical expression and came into contact with something greater than himself. Daoism also encouraged enjoyment of nature and simple life. A number of Daoist poets, such as Tao Qian (365 - 427) and Li Bai (701-762) distanced themselves from the Confucian bureaucracy and lived a life of freedom in the countryside. A statue of a Bodhisattva from the Song Dynasty (960-1279 C.E.). Buddhism, which arrived in China around the first century C.E., had some affinity with Daoist concepts of harmony with nature, transience of earthly life, and transcendence of suffering. Buddhist art had several functions: the creation of statuary and images to invoke the presence of the Buddha in temples and shrines; spiritual education through imagery, drama and poetry; and as a meditative discipline. Buddhism is especially associated with statuary and architecture in China. The Northern Wei dynasty (386 – 534) sponsored the carving of some 50,000 stone sculptures in 50 grottos at the Yungang Cave Temples and the Longmen Cave Temples near Luoyang, located directly on the trade routes from central Asia. The earliest sculptures are in the Mogao Grottos (Mogao Caves) near Dunhuang in Gansu Province along the old Silk Road. During the middle of the sixth century, free-standing, three-dimensional sculptures of Buddha, bodhisattvas (pusa), and Maitreya (Milofo) began to be produced in a uniquely Chinese style. Buddhist architecture and sculpture thrived in the Sui and Tang dynasties (581 – 960). The Tang Dynasty was particularly open to foreign influence, and Chinese Buddhist sculpture returned to a classical form, inspired by Indian art of the Gupta period. 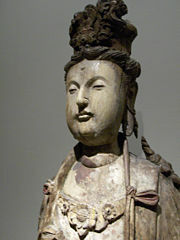 Buddhist sculpture continued to flourish for about 600 years until the Ming dynasty. After this time exquisite miniature sculptures were produced in jade, ivory, and glass. The architecture of Buddhist temples resembled that of Confucian and Daoist shrines and temples. Pagodas, based on Indian stupas, were constructed to house sacred scriptures and relics. Some pagodas had as many as 15 stories, each with a curved, overhanging roof. About 10,000 pagodas still exist in China today. Li Qingzhao (1084 – c. 1151), one of the best-known Buddhist poets, is considered a master of wanyue pai ("the delicate restraint"). Her poems, describing the varying fortunes of her life, are an example of the Buddhist theme of transience. In ancient China, calligraphy was considered the highest and purest form of painting. The implements were the brush pen, made of animal hair, and black inks, made from pine soot and animal glue. Writing was done on silk until the invention of paper in the first century. Though calligraphers followed stylized principles, their writing was judged by its spontaneity, force and vitality. Original writings by famous calligraphers have been greatly valued throughout China's history. Green Hills and White Clouds, by Gao Kogong, 1270-1310 C.E. The earliest Chinese painting was decorative, consisting of the geometric patterns and animals painted on Stone Age pottery. Murals and early examples of painting on silk and lacquer ware have been found in tombs and burial sites from the Warring States Period (481 – 221 B.C.E.). Chinese painting was an outgrowth of calligraphy, using the same brushes and inks on silk or paper. Because watercolor ink did not permit the correction of errors, the painter needed to plan his work in his mind before touching the brush to paper, and execute it quickly. The flowing lines of Chinese calligraphy and painting influenced the decoration on statuary, bronze castings, porcelain and textiles, including embroideries. The first Chinese paintings were figure paintings of immortals, emperors, court ladies, social scenes, and common people at their work. Many were illustrations of Confucian moral teachings. Figure painting reached its height during the Tang dynasty. Landscape painting (shan shui) also reached its first maturity during the Tang period. Bird and flower painting (huahua) became a distinct category during the tenth century C.E. Oil painting was introduced to China during the 1800s, and a number of artists went abroad to study. Chinese painters of the twentieth and twenty-first centuries have taken a number of directions, including the preservation of traditional water-color painting (guohua), the fusion of Chinese elements with Western techniques, and the use of Western styles to explore Chinese themes and social issues. Modern Chinese artists often combine painting with other media such as film, sound and sculpture. A Song Dynasty porcelain bottle with iron pigment over transparent colorless glaze, eleventh century. Shards of Chinese pottery have been found dating back as far as 10,000 B.C.E.. Chinese porcelain began to be produced during the Eastern Han dynasty (25 -220 C.E.) and was highly developed by the sixth century C.E.. Porcelain making reached its height in the Song dynasty (960-1279 C.E.). During the reign of the Song Emperor Huizong (1100 – 1126), five famous kilns produced some of the finest and most treasured Chinese porcelain, some of it under his direct supervision. As new chemical processes for glazing were discovered, Chinese porcelain became more colorful. During the late Ming and Qing dynasties, bright colors including deep red, ruby, jade green, bright yellow and peacock blue came into use, and enamel glazes, glazes over carved coatings, and combinations of painting and carving were used. Chinese artisans have always borrowed openly from previous styles, but there has also been a historical tradition of reproductions and forgeries made to look like earlier pieces. In English the word china has become synonymous with high-quality porcelain. Objects made from an alloy of copper and tin were produced in China during the Shang dynasty (1750 – 1040 B.C.E.) and included ceremonial vessels, weapons, and chariot fittings. During the Zhou dynasty (周, 1100 – 256 B.C.E.) designs became more complex and techniques were developed to inlay the bronzes with precious metals and gemstones. Objects were also created for everyday use. During the 5th to 4th centuries B.C.E. iron began to replace bronze, and the unification of China under the Qin dynasty (221 B.C.E. – 206 C.E.) 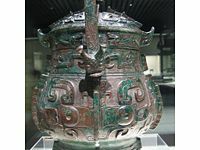 marked the end of the bronze age in China.The appreciation of bronze items as works of art began during the Song Dynasty (宋) and reached its zenith in the Qīng dynasty (清) in the reign of the Qiánlóng emperor (乾隆), whose massive collection is recorded in the catalogs known as the Xīqīng gǔjiàn. 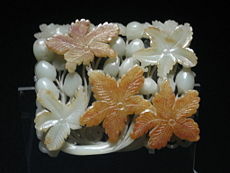 Jade (nephrite) carvings have been used in virtually all periods of Chinese history and reflect the style of decorative art characteristic of each period. Jade, (Yu in Chinese) considered the "imperial gem," was used to create many utilitarian and ceremonial objects, ranging from indoor decorative items, engraved seals (chop), snuff boxes and jewelry, to jade burial suits. The earliest jades, of the Neolithic Period, are quite simple and unornamented; those of the Shang (eighteenth–twelfth century B.C.E. ), Zhou (1111–255 B.C.E. ), and Han (220 B.C.E.– 206 C.E.) dynasties are increasingly embellished with animal and other decorative motifs characteristic of those times; in later periods ancient jade shapes, shapes derived from bronze vessels, and motifs from paintings were used, demonstrating the craftsman's extraordinary technical facility. Traditional Chinese buildings are made of timber and have a post and lintel frame topped with a system of interlocked brackets which supports a massive, steeply sloping, tiled overhanging roof, sometimes with upswept eaves. This structure gives the buildings a strongly horizontal influence. Interior rooms and structures are symmetrically arranged according to Confucian principles of hierarchy, often with a central structure flanked by two wings, and outer walls that enclose courtyards and gardens. Bright lacquer paints protected and preserved the wood. There is evidence of a well-developed musical culture in China as early as the Zhou Dynasty (1122 B.C.E. - 256 B.C.E.). Early Chinese music was based on percussion instruments, which later gave away to string and reed instruments. One of the Five Classics, supposedly edited by Confucius, is the Shijing (Book of Songs), a collection of poems from folk songs or songs performed at banquets or at ritual sacrifices. In ancient China, music was regarded as central to the harmony and longevity of the state. Chinese traditional music is played on solo instruments or in small ensembles of plucked and bowed stringed instruments, flutes, and various cymbals, gongs, and drums. The scale has five notes. Bamboo pipes and qin are among the oldest known musical instruments from China. Chinese orchestras traditionally consist of bowed strings, woodwinds, plucked strings and percussion. Chinese vocal music has traditionally been sung in a thin, non-resonant voice or in falsetto and is usually solo rather than choral. All traditional Chinese music is melodic rather than harmonic. Chinese vocal music probably developed from sung poems and verses accompanied by music. With the establishment of the Republic of China in 1911, there was an increasing interest in Western music, and attempts to adapt both Western classical music and popular music. Chinese popular music originated with the shidaiqu genre founded by Li Jinhui (1891 – 1967) in mainland China, with Western jazz influences from Western musicians such as Buck Clayton. In 1949 the Kuomintang relocated to Taiwan, and the People's Republic of China was established on the mainland. The Communist party denounced Chinese popular music as "yellow music" (pornographic music), and promoted guoyue (revolutionary songs) instead. The Cultural Revolution and other Maoist initiatives, and the continuing censorship of the Chinese government, delayed the political climate changed under new policies by Deng Xiaoping. The introduction of Western pop and rock music in China began when 500 copies of John Denver songs were brought into China and distributed to state radio stations in 1986 by Deng Xiaoping returning from his visit to Washington, DC. Chinese variety art, known in the west as "Chinese circus"
Popular performances such acrobatics and variety shows have always been popular in China. Chinese opera originated in the Tang dynasty. Emperor Xuanzong (712–755) founded the "Pear Garden" (梨园), the first known opera troupe in China, to perform for his personal enjoyment. Kunqu, the oldest extant form of Chinese opera, developed during the Song Dynasty in Kunshan, near present-day Shanghai. In the Yuan dynasty (1279–1368), forms like the zaju (杂剧, variety plays), in which dramas are based on rhyming schemes and incorporate specialized character roles like "Dan" (旦, female), "Sheng" (生, male) and "Chou" (丑, Clown), were introduced. Yuan dynasty opera exists today as Cantonese opera. Beijing opera or Peking opera (Simplified Chinese: 京剧; Traditional Chinese: 京劇; pinyin: Jīngjù) is a form of Chinese opera which arose in the late eighteenth century and became fully developed and recognized by the mid-nineteenth century. Beijing opera features four main types of performers, as well as numerous secondary and tertiary performers with elaborate and colorful costumes. On a sparsely decorated stage, the actors use speech, song, dance, and combat skills in movements that are symbolic and suggestive, rather than realistic. Performers adhere to a variety of stylistic conventions that help audiences navigate the plot of the production. Melodies include arias, fixed-tune melodies, and percussion patterns. Chinese folk arts have a long history, and many traditions are still practiced today. Some are specific to a particular ethnic group or region, and there are usually some variations among provinces. Two forms of paper art originated with the invention of paper in the Han Dynasty. The invention of paper during the Han dynasty spawned two new Chinese arts. Chinese paper cutting originated as a pastime among the nobles in royal palaces. The oldest surviving paper cut out is a symmetrical circle from the sixth century found in Xinjiang, China. The art of Chinese paper folding also originated in the Han dynasty, later developing into origami after Buddhist monks introduced paper to Japan. 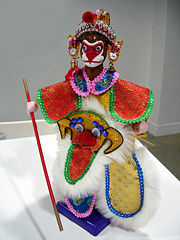 Taiwanese Sun Wukong (Monkey God) glove puppet. One of the oldest forms of folk art is puppetry. Puppeteers use various kinds of puppets, including marionettes, glove puppets, rod puppets, cloth puppets, and wire puppets in performances incorporating folk songs and dances over some dialogues. The subject matter is derived mainly from children's stories and fables. Chinese Shadow theater is a form of puppetry that is performed by moving figures made of animal skins or cardboard held behind a screen lit by lamplight. The subject matter and singing style in shadow plays are closely related to Chinese opera. 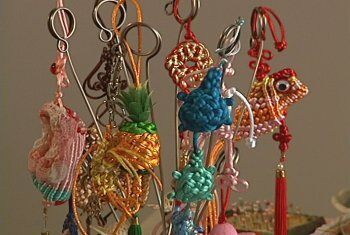 Example of the different colors and designs used in Chinese knotting. Chinese knotting (Chinese: 中國结; pinyin: Zhōngguó jié) that began as a form of folk art in the Tang and Song dynasties (960-1279 C.E.) and was later popularized in the Ming and Qing dynasties (1368-1911 C.E.). The art is also referred to as . The earliest evidence of knotting has been preserved on bronze vessels of the Warring States period (481-221 B.C.E. ), Buddhist carvings of the Northern Dynasties period (317-581) and on silk paintings from the Western Han period (206 B.C.E.- 6 C.E.). References to knotting have also been found in literature, poetry and the private letters of some Chinese rulers. Knotting is mentioned extensively in the first Chinese epic novel, Dream of the Red Chamber. Craftsmen were employed by the imperial courts to fabricate tassels and knotted cords for many purposes. The art of tying knots continued to evolve over thousands of years with the development of more sophisticated techniques and increasingly intricate woven patterns. During the Qing Dynasty (1644-1911) knotting was accepted as an art form by Chinese society. From the founding of the Republic of China in 1911, when China began modernizing until the end of the Cultural Revolution in 1976, the art of Chinese knotting was almost lost. In the late 1970s a resurgence of interest occurred in Taiwan, largely due to the efforts of Lydia Chen (Chen Hsia-Sheng) of the National Palace Museum who founded the Chinese Knotting Promotion Center. Emperor Xuanzong's Journey to Sichuan, a Ming Dynasty painting after Qiu Ying (1494-1552). ↑ Attitudes Towards Nature in Daoist ArtAskAsia.org. Retrieved September 3, 2008. ↑ Nancy A. Guy, "The Appreciation of Chinese Opera: A Reply to Ching-Hsi Perng." (in Forum for Readers and Authors) Asian Theatre Journal 7 (2) (1990): 254–259, Retrieved September 3, 2008. ↑ Chinavoc.com. "[www.chinavoc.com/arts/folk/papercut.htm Artistic Creations from Nimble fingers]. Retrieved September 2, 2008. Watson W. & Chuimei Ho. The Arts of China, 1600-1900. Vol 3 (of 3), Yale University Press, 2007. ISBN 0300107358, to AD 1900. New Haven, CT: Yale University Press, 1995. This page was last modified on 13 February 2017, at 17:15.